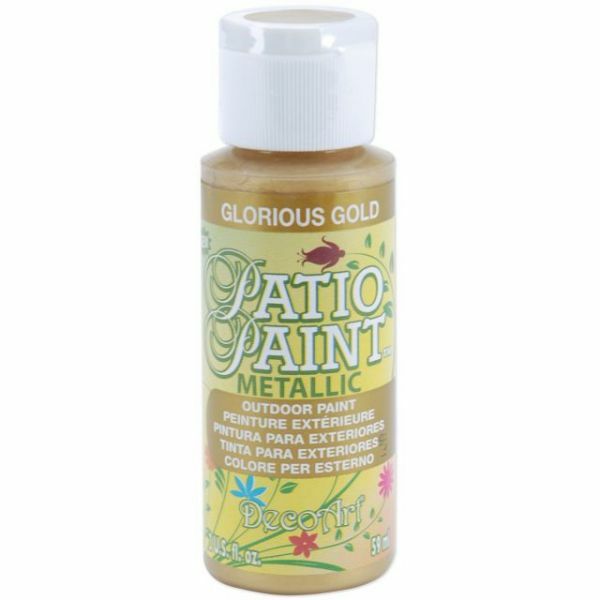 Deco Art Glorious Gold Patio Paint - DECOART-Patio Paint Metallics. Brighten and energize a whole project or add super-charged highlights to a large one. 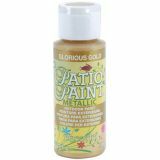 This all-purpose acrylic paint is perfect for home crafts with surfaces such as concrete, terra cotta, wood, masonry, stucco, stone, unglazed ceramics, cast aluminum, and Styrofoam. DecoArt patio paints feature fewer additives, excellent adhesion to a variety of surfaces, better coverage than most brands, smooth blending, non-toxic, acid free, soap and water clean-up and environmentally friendly. This package contains one 2oz/59ml bottle. Conforms to ASTM D4236. Made in USA.